A free coffee is bound to brighten anyone’s day. But what if it could help someone in need? 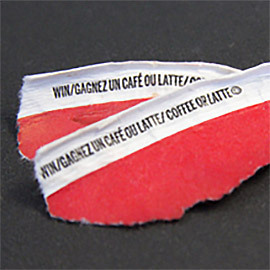 With the annual Tim Hortons Roll up the Rim to Win contest back for another year and the February cold tightening its grip, Cec Joyal, a development officer at Laurier, is once again collecting winning Roll Up tabs for people experiencing homelessness. Joyal, who is also a Laurier alumna, says giving a winning tab to a homeless person means so much more than a free coffee, donut or muffin. To them, it also means a brief respite from the bitter cold of winter. “Then I wondered if I could really do something with this and start collecting them,” says Joyal. This year, the tabs will be distributed to people in need at numerous community service locations, as well as local churches that host community suppers. In past years, Joyal has collected nearly 3,000 winning tabs from the Laurier community, community members in Kitchener-Waterloo and Brantford, her friends and family and elementary and high schools from around Ontario that organize collections of their own. Anyone wishing to donate a winning tab can do so at a drop box at International News on Laurier’s Waterloo campus or at Joyal’s office in Alumni Hall; tabs can be dropped off in person or sent through interoffice mail. On the Brantford Campus, tabs collected will be delivered to the Salvation Army Booth Centre on Dalhousie St. where they will be distributed to the homeless. Tabs can be sent or personally delivered to Penny Friesen in the SC Johnson building room 102 or Janice Vilaca, SC Johnson building 414. To find out more, contact Cec Joyal at cjoyal@wlu.ca or 519-884-0710 ext. 3864.